It was discovered on November 11, 2002 at Lowell Observatory. As of February 2013, 2002 VE68 has been observed telescopically 457 times with a data-arc span of 2,947 days and it was the target of Doppler observations in 5 occasions; therefore, its orbit is very well determined. Its semi-major axis (0.7237 AU) is very similar to that of Venus but its eccentricity is rather large (0.4104) and its orbital inclination is also significant (9.0060°). The spectrum of 2002 VE68 implies that it is an X-type asteroid and hence an albedo of about 0.25 should be assumed. This combined with an absolute visual magnitude of 20.50 gives a diameter of about 200 m. Its rotational period is 13.5 h and its light curve has an amplitude of 0.9 mag which hints at a very elongated body, perhaps a contact binary. The existence of retrograde satellites or quasi-satellites was first considered by J. Jackson in 1913 but none was discovered until almost 100 years later. 2002 VE68 was the first quasi-satellite to be discovered, in 2002, although it was not immediately recognized as such. 2002 VE68 was identified as a quasi-satellite of Venus by Seppo Mikkola, Ramon Brasser, Paul A. Wiegert and Kimmo Innanen in 2004, two years after the actual discovery of the object. From the perspective of a hypothetical observer in a frame of reference rotating with Venus, it appears to travel around the planet during one Venusian year although it does not orbit Venus but the Sun like any other asteroid. As quasi-satellite, this minor body is trapped in a 1:1 mean-motion resonance with Venus. Besides being a Venus co-orbital, this Aten asteroid is also a Mercury grazer and an Earth crosser. 2002 VE68 exhibits resonant (or near-resonant) behavior with Mercury, Venus and Earth. It seems to have been co-orbital with Venus for only the last 7,000 years, and is destined to be ejected from this orbital arrangement about 500 years from now. During this time, its distance to Venus has been and will remain larger than about 0.2 AU (3·107 km). 2002 VE68 is included in the Minor Planet Center list of Potentially Hazardous Asteroids (PHAs) because it comes relatively frequently to within 0.05 AU of Earth. Approaches as close as 0.04 AU occur with a periodicity of 8 years due to its near 8:13 resonance with Earth. 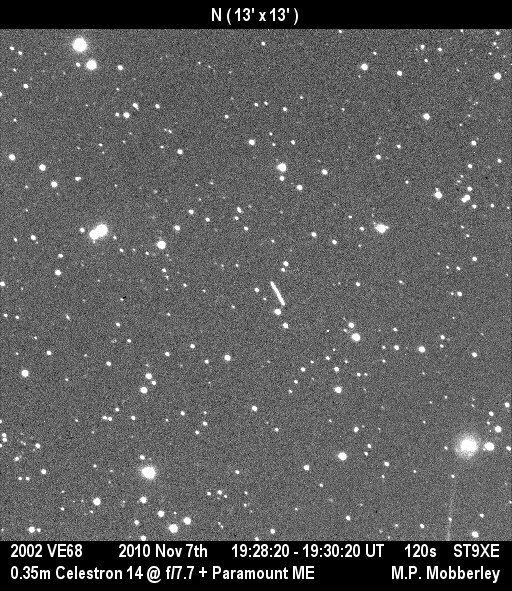 2002 VE68 was discovered during the close approaches of November 11, 2002. During the last close encounter on November 7, 2010, 2002 VE68 approached Earth within 0.035 AU (13.6 Lunar distances), brightening below 15th magnitude. Its next fly-by with Earth happened on November 4, 2018 at 0.038 AU (5,700,000 km; 3,500,000 mi). Numerical simulations indicate that an actual collision with Earth during the next 10,000 years is not likely, although dangerously close approaches to about 0.002 AU are possible, a distance potentially within earth's Hill sphere. ^ This is assuming an albedo of 0.25–0.05. ^ a b c d "2002 VE68". JPL Small-Body Database. Jet Propulsion Laboratory. SPK-ID: 2002VE68. Retrieved 30 March 2016. ^ de la Fuente Marcos, Carlos; de la Fuente Marcos, Raúl. "Asteroid 2012 XE133, a transient companion to Venus". Monthly Notices of the Royal Astronomical Society. 432 (2): 886–893. arXiv:1303.3705. Bibcode:2013MNRAS.432..886D. doi:10.1093/mnras/stt454. ^ "JPL Close-Approach Data: (2002 VE68)" (2010-12-06 last obs (arc=8 years)). Retrieved 5 January 2013. Retrograde satellite orbits, by Jackson, J. 1913, Monthly Notices of the Royal Astronomical Society, Vol. 74, pp. 62–82. Asteroid 2002 VE68, a quasi-satellite of Venus, by Mikkola, S., Brasser, R., Wiegert, P., & Innanen, K. 2004, Monthly Notices of the Royal Astronomical Society, Vol. 351, Issue 3, pp. L63-L65. The population of Near Earth Asteroids in coorbital motion with Venus Morais, M. H. M., Morbidelli, A. 2006, Icarus, Vol. 185, Issue 1, pp. 29–38. On the dynamical evolution of 2002 VE68, by de la Fuente Marcos, Carlos; & de la Fuente Marcos, Raúl (2012), Monthly Notices of the Royal Astronomical Society, Vol. 427, Issue 1, pp. 728–739. Asteroid 2012 XE133: a transient companion to Venus de la Fuente Marcos, Carlos; de la Fuente Marcos, Raúl (2013), Monthly Notices of the Royal Astronomical Society, Vol. 432, Issue 2, pp. 886–893.